► Reservations must be made 6 weeks in advance. ► Docent-led Tours are available on Tuesday through Saturday, year-round. ► Reservations must be made 2 weeks in advance. ► Visits are available on Tuesday through Saturday, year-round. ► Tours are free and available for groups of 10+ students. ► Reservations are not final until you receive a confirmation email from the Education Department. ► Buses must unload and load at the designated “Bus Drop-Off." ► Arrival: Enter through the Gatehouse and proceed to the Welcome Center in the Visitors Pavilion. Upon arrival, the group leader must check-in at Admissions to receive wristbands for the group. In this space, students can check-in and get organized before entering the museum. This is also a good space to wait for students if you are arriving separately. ► Docent-led Tours: Your docent(s) will meet you in the Visitors Pavilion. Please have your students divided into the requested number of groups. ► Teacher-guided Visits: Once your check-in process is complete, you can explore the museum grounds on your own. ► Lunches may be left in the wagons found in the Welcome Center. Outdoor picnic tables are available for your use. Food is also available for purchase at Muse at the Ringling restaurant, the Banyan Café and the Museum Café. ► Backpacks may not be carried through the galleries. ► Food, drink, and gum are not allowed in the galleries. ► Photography is allowed, as long as no flash is used. Please do not photograph inside Ca’ d’ Zan. ► Sketching is permitted in the galleries and throughout the grounds. Clipboards are available upon request. ► Questions or concerns during your visit can be directed to any security guard wearing a black jacket. A map of The Ringling to help you find your way around the estate. 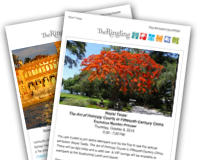 Ensure that your visit to The Ringling is a success.